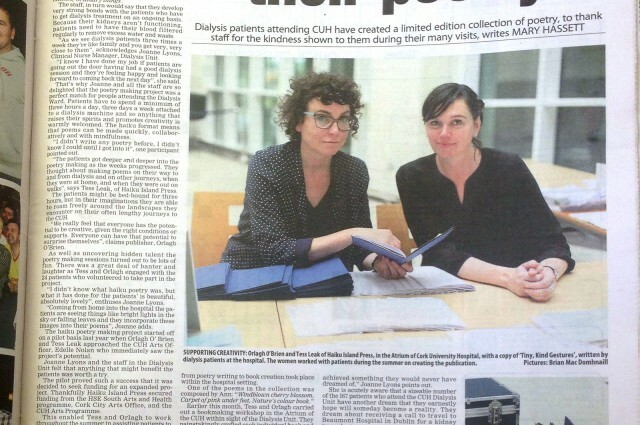 A poetry and book-making project which took place in the Department of Renal Medicine in Cork University Hospital. Haiku Island Press worked with a group of patients, during their dialysis treatment, to create a collection of haiku poems, which lead to the on-site production of a limited edition book. 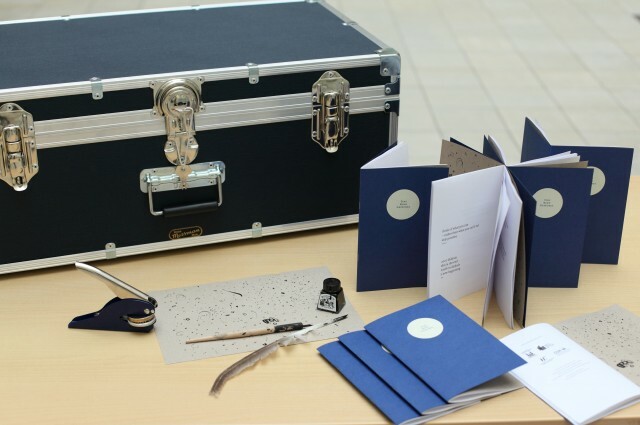 Inspired by Jeremy Deller’s idea: “Art is not what you make, it’s what you make happen” the artist’s ambition was to not only create a high quality hand-made edition of books, but to instigate a poetry making culture in the hospital. The artists consider the book both a symbol of empowerment and change-making agent. They aimed to develop a multi-disciplinary method of poetry book-making and publishing in healthcare settings where the process and results could be shared and toured publicly. 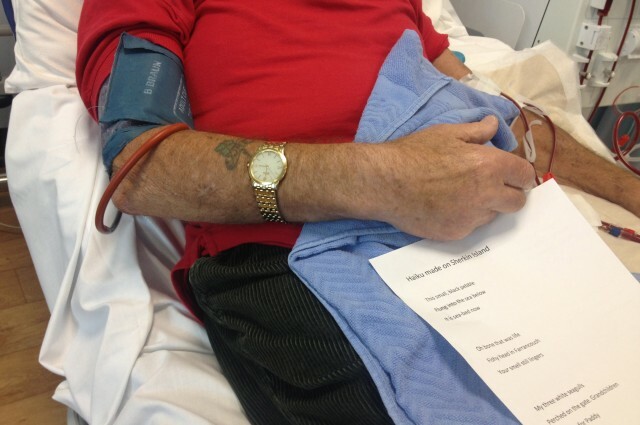 The group was made up of 24 patients undergoing renal dialysis treatment sessions lasting for 3 hours at a time. 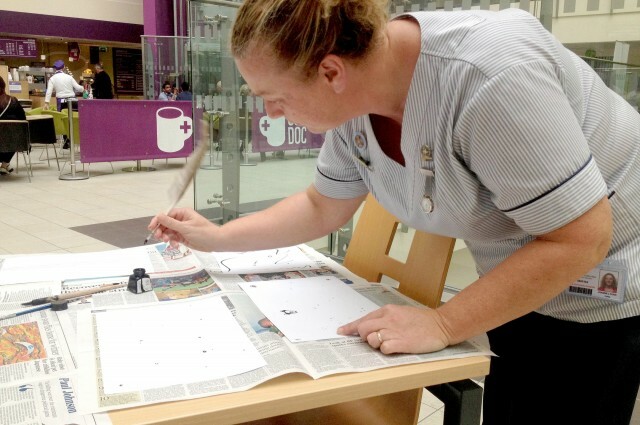 The Cardiac Renal Centre is part of CUH which has a long-standing history of supporting various participatory projects which are under the guidance of Arts Co-ordinator Edelle Nolan. Originally from Japan, haiku are short three-line poems, often evoking the natural world. During the research phase of this project in 2015, the artists discovered haiku making is particularly suited to a healthcare setting in that the process is non-invasive, flexible and gentle. Orlagh and Tess started at opposite ends of the ward and sat ‘one to one’ next to the patients during their dialysis treatment with only a note pad and pen to hand. This meant they were able to move out of the way when staff needed, for example, to make adjustments to the equipment or check on the patient. Some Haikus arose out of conversations about detailed observations of the natural world during favourite walks. Others were about health challenges such as the strict diet Dialysis patients have to follow. 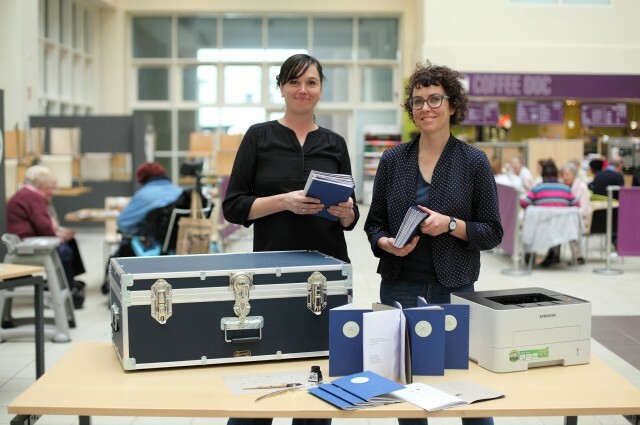 The one day open workshop, held in the Hospital Atrium and in view of the Renal Unit, was designed to share as much of the book-making process as possible: Orlagh and Tess set up a printer, tools and materials and people turned up to watch the process unfold throughout the day. Staff, patients and visitors to the hospital were invited to contribute to a drawing that would become the endpapers of the book. 100 copies of the book were constructed during the day. A limited edition (150 copies) of a handcrafted book titled Tiny, Kind Gestures containing the collection of Haiku Poems created by the participants. The books were made in the atrium of the hospital by the artists during a day- long workshop which was open to staff, patients and visitors. 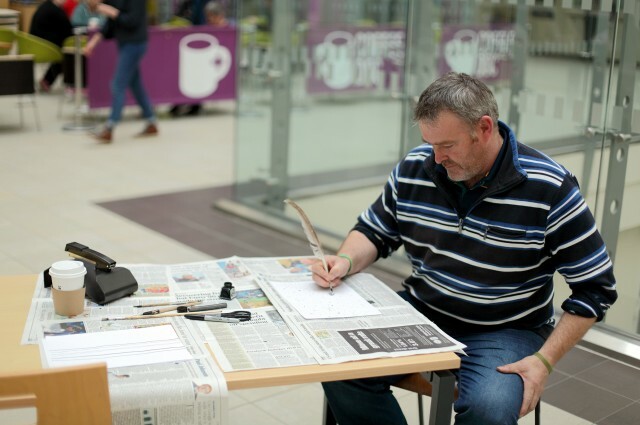 An exhibition of the poems as well as a book launch and reading took place in the Atrium on November 2nd. Participants, their families, friends, staff, funders, local libraries and arts organizations were all invited to help celebrate. The artists found that the Haiku form was really suited to the wards. It was non-invasive, low pressure and poems could evolve naturally during conversations with participants. The artists also found that bringing the contemplation of nature into a clinical environment supported an atmosphere of calmness and creativity. There was a real appreciation by the participants and staff of the quality of the resulting poetry collection and the book-object itself. We had originally proposed that we would invite staff to participate in the haiku-making but learnt that it was too much to expect creative contributions them as their work is so intensive. Their support and interest was frequently palpable however and this in itself contributed to the creative atmosphere on the ward. “I didn’t know what haiku poetry was, but what it has done for the patients’ is beautiful, absolutely lovely….it’s uplifting to know that the patients have achieved something they never would have dreamed of” Joanne Lyons, Clinical Nurse Manager on the Renal Unit.